Sigh... not sure why attaching images has to be so difficult. Yeah. It's been a pain trying to view any posted pics, lately. They all appear as postage stamp sized. But thanks for the attempt. I had that problem the other day when I try to add the picture as "full size", going down to the next size which I think is Large solved the problem. I stopped posting them to the forum but instead started using my SmugMug account with a link to here. The scale of this project continues to amaze me. 1:30: They’ve removed most of the vertical forms on the Fantasmic backstage storage area and lowering a compressor or generator onto the top horizontal slab. 2:50: Rockwork steel support structure going in to the east of the Fantasy Land entrance tunnel on the Fantasy Land side. 5:00: Vertical forms going in around the show building excavation. 8:00: Lowering material into the deeper excavated area of the show building…it would be interesting to see what they are forming down there. 10:05: They’ve installed scaffolding around the rockwork facing Big Thunder Trail, getting ready to apply the cement slurry surface. 11:20: Workers applying texture to the rockwork on the new point of TSI. 13:30: The forms have been removed from the vertical concrete walls below the Hungry Bear. 14:35: They’re going lower with the the lumber between the vertical beams where they chopped off the original berm behind the HB. 16:40: A look at the new access road through the fence along Disneyland Dr.
17:20: Looking through the fence at the concrete structure closer the DL Dr., they removed some of the forms. 19:00: A view of the rockwork from the Big Thunder Trail…very interesting formations. Very interesting! I'm intrigued by what appears to be something like a jagged boulder balanced atop a rock pillar, as seen at roughly 19:15. It seems almost MTTNW-ish. At this rate, before the end of the year we should be seeing much more of the creative details to obsess over. At the 21:00 mark of the most recent video, what does it say on the rock work in the back? Turn your head sideways... "WRONG ?????" Good question! There are a lot of branches in the way, but I think I can make out 'vel' in the middle of it. Maybe 'wrong level'? I've grabbed a screen shot and rotated it 90 degrees. The image is attached. Maybe someone else will have more luck with it. The second word is Traveler. So it says "Wrong Traveler". A traveler can be a number of things. In theater, it's a laterally opening and closing curtain system or in some cases actual scenery that "travels" on a track. The term can also refer to various parts of that hardware, as in a device that slides along a bar to allow motion. I'm certainly not sure what it means in this instance, although the fact that the text is sprayed on in the same manner as all of the identifying part codes indicates that whatever is wrong was noticed at that time and apparently it wasn't wrong enough to keep them from welding it in place anyway. Perhaps it was already made right prior to installation (my guess). It could be referring to some sort of ring or fitting that had some adjustability for the fitting of the piece onto the steel superstructure. All speculation. Another video from Nov. 1 that I don't think has been posted yet. 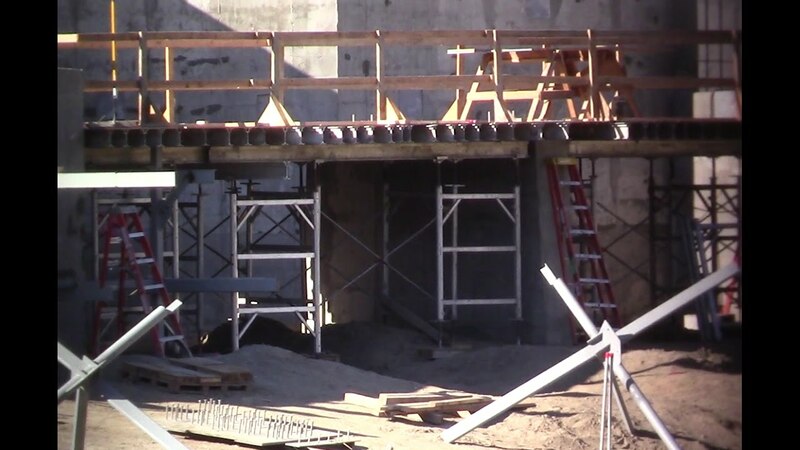 It has a few new shots, especially at 3:30 where they show what is likely the foundation for a perimeter wall to block views of backstage areas from M&F or as support for background rock work (similar to Cars Land). There's commentary - the guy tries, but he is pretty uninformed. More new video. I haven't checked it out, yet, so I don't have any notes to add. 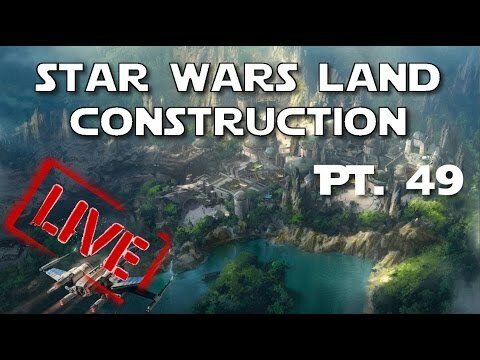 I doubt that the new wall is for blocking sight lines, as it in the middle of what will be SWL, between the Storm Trooper escape and Millennium Falcon attractions. I'm betting that it is the beginning of the exterior wall for what will end up being he Storm Trooper Escape building. That brings up an interesting point. Based on what we have seen of the plans for SWL, it seems that there will not be that many truly separate buildings, but rather like the whole north side will be one large building, similar to how much of TL is one extended structure, but even more connected. 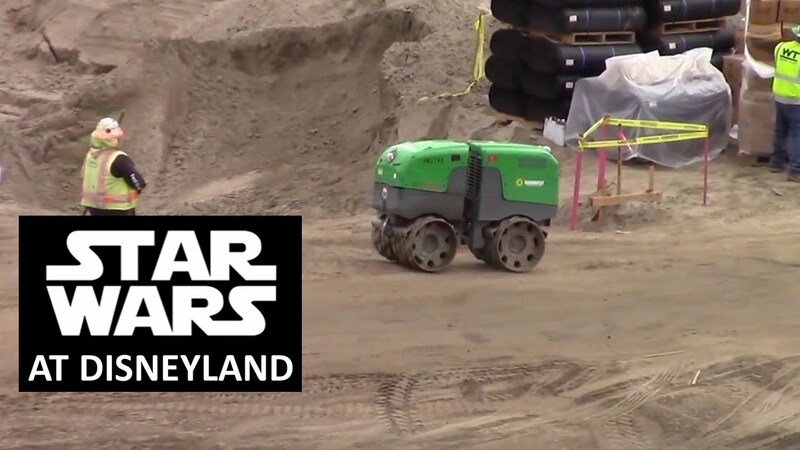 The part of this video https://www.youtube.com/watch?v=3LSzd--76I8 from 3:30 to 4:30 shows the foundation for a wall pretty close to Disneyland Drive. That's what I'm talking about and thinking it's a sight-blocking wall. Ah, right. I thought you were referring to the wall further in, beyond the 'pool', which is easily seen around the 5:00 mark. If you're referring to the wall near the exterior fence, which is still just a ditch, then I agree that it will have to be part of the exterior wall of SWL, next to which the service road will run. It will be neat to see what they eventually do with the exterior of the wall. They may do nothing special with it, but they could apply a nice mural to it, with... any number of cook Disneyland imagery. Thanks for the info, Mr. Toad. I believe that those footings are for the back wall of the Alcatraz facility. They are too big for just a stand alone wall. The portion that the bulldozer is working on appears to be the backstage road behind the attraction. Could it be for "distant" rock spires as seen in some of the concept art? Something like what they did with Cars Land where much of the tailfin mountains are used to block sight lines out of the park. I suspect they'd have similar rock work to block views of M&F but also to give the land that deep 3D feel. I would imagine that any rockwork would be at the front and top of the facility buildings. As SWL will be long and narrow, the closer the roadwork, the more it hides. There shouldn't be any long distance views to deal with as SWL should be entirely hidden by the Frontierland berm. I doubt they will have any concerns with the back side of the facility. They didn't have any with the backside of the Carsland rockwork. New video from Saturday 11/5/16. No work being Saturday but interesting to see the progress. New vertical forming going in around the show building excavation and a lot going on behind the Fantasy Land Theatre. 3:15: Stair step footings east of the Fantasy Land entrance tunnel. 3:50: More vertical forming above the Fantasmic backstage storage area. 6:30: More vertical rebar along ROA. 7:20: New planting where the Skyway Chalet used to be. 7:45: View of rock formations from Big Thunder Trail. 9:40: Footings in place to the path from Critter Country to SWL. 10:40: It looks like they may be forming a horizontal slab where the RLRR will pass over a trestle. More videos. The first one is short but looks like it was taken from the service road, near where they are starting to build the new wall along the eastern edge of what will likely be the storm trooper escape attraction.